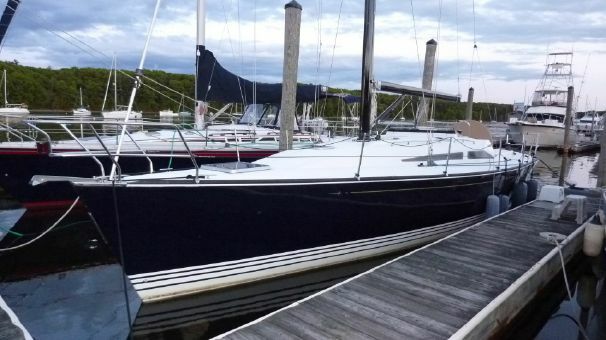 Price reduced, Very nice condition ready to sail away. 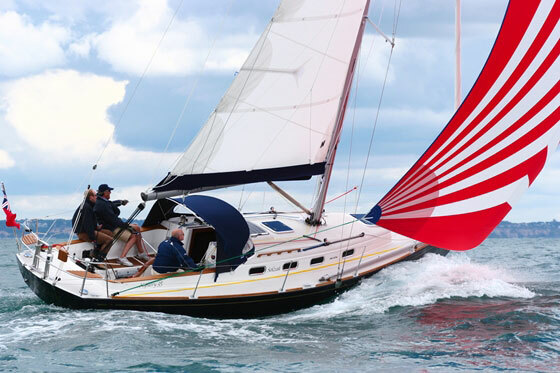 This is a magnificent example of this fast and responsive Pedrick designed Freedom 35. Her owners have been meticulous in her care. 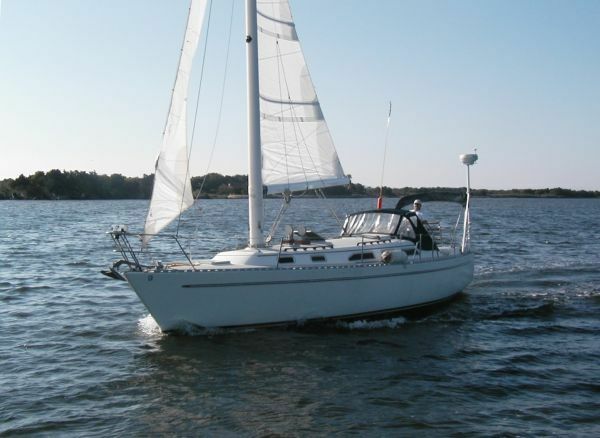 Well outfitted, her equipment list is long and includes in part a CruiseAir Air Conditioning, Chartplotter, Autopilot, VHF, Sailing instruments, refrigeration, microwave, Dinghy Davits and Radar Check full specs for all details. The Freedom 35 layout sleeps six in two private staterooms including a vee berth forward and large oversized double berth aft. These cabins are roomy and inviting and each is well ventilated. The main salon features a straight settee to starboard with an "L" shaped settee to port. There is a bulkhead mounted table to port which folds down with two leaves to sit 6 for dinner or folds up out of the way when not in use. The navigation station is to starboard and includes a large table with three drawer storage under. The head is large and has a separate stall shower with clear acrylic bi-fold door. There is also a folding seat and wet locker in the shower and custom mirror. The head is conveniently located close by the companionway as is the "L" shaped galley which is well suited for meal preparation. The galley is adjacent to the companionway and is open to the main salon. There is a deep, double-basin, polished stainless steel sink, 8.5 cu. ft. fridge with beverage cooler compartment, built-in Microwave oven, two burner propane cooktop, and custom storage lockers above and below. 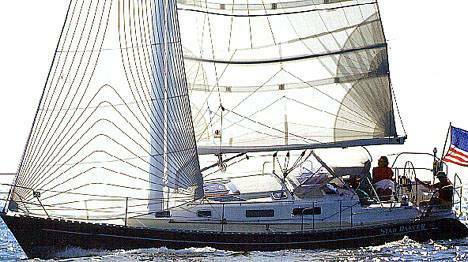 The Freedom 35 may be the best sailing Freedom design ever. 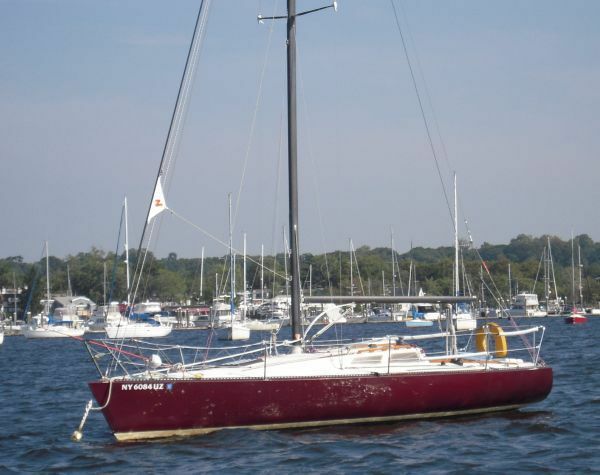 She utilizes a carbon fiber free standing mast with a large fully battened mainsail and Camberspar jib. Sailing this boat shorthanded is a breeze. All sail controls lead through clutch style stoppers to the cockpit. One manual and one Electric winch Halyards, Harken Battcar system, vang, and Lazy Jacks for mainsail make sail chores a snap. Walk out transom for easy dinghy, fish or swimmer boarding! A custom breaker panel is located at the nav station for ship 12v DC and shore 120v AC systems. DC and AC volt and ammeters help monitor these systems. Wiring is neatly organized and accessible. House and engine start battery banks are separate and controlled by a parallel switch.